Prison Economics Helped Drive Immigration Law The state's new law could send hundreds of thousands of illegal immigrants to prison. An analysis of fund-raising documents, lobbying records and corporate reports shows that the private prison industry helped draft and pass the measure. "The gentleman that's the main thrust of this thing has a huge turquoise ring on his finger," Nichols said. "He's a great big huge guy and I equated him to a car salesman." "They talk [about] how positive this was going to be for the community," Nichols said, "the amount of money that we would realize from each prisoner on a daily rate." But Nichols wasn't buying. He asked them how would they possibly keep a prison full for years — decades even — with illegal immigrants? "They talked like they didn't have any doubt they could fill it," Nichols said. That's because prison companies like this one had a plan — a new business model to lock up illegal immigrants. And the plan became Arizona's immigration law. The law is being challenged in the courts. But if it's upheld, it requires police to lock up anyone they stop who cannot show proof they entered the country legally. When it was passed in April, it ignited a firestorm. Protesters chanted about racial profiling. Businesses threatened to boycott the state. 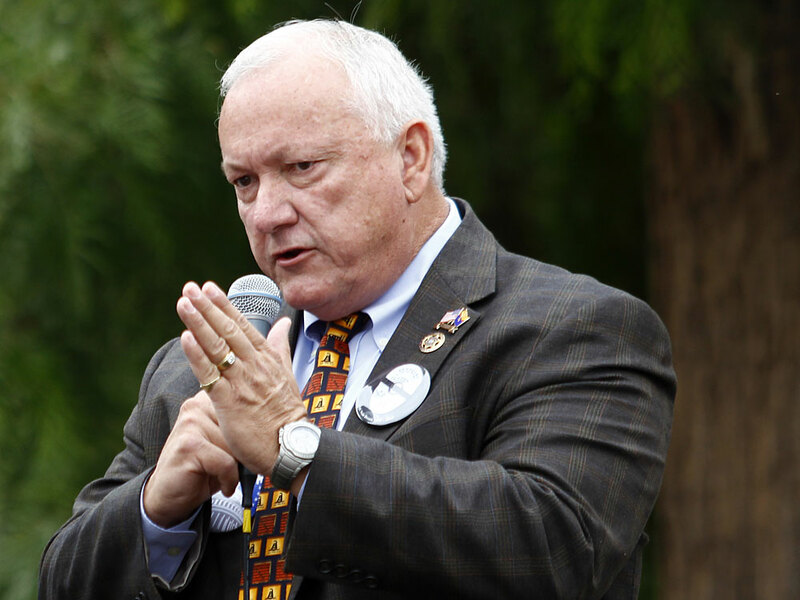 Arizona state Sen. Russell Pearce, pictured here at Tea Party rally on Oct. 22, was instrumental in drafting the state's immigration law. He also sits on a American Legislative Exchange Council (ALEC) task force, a group that helped shape the law. 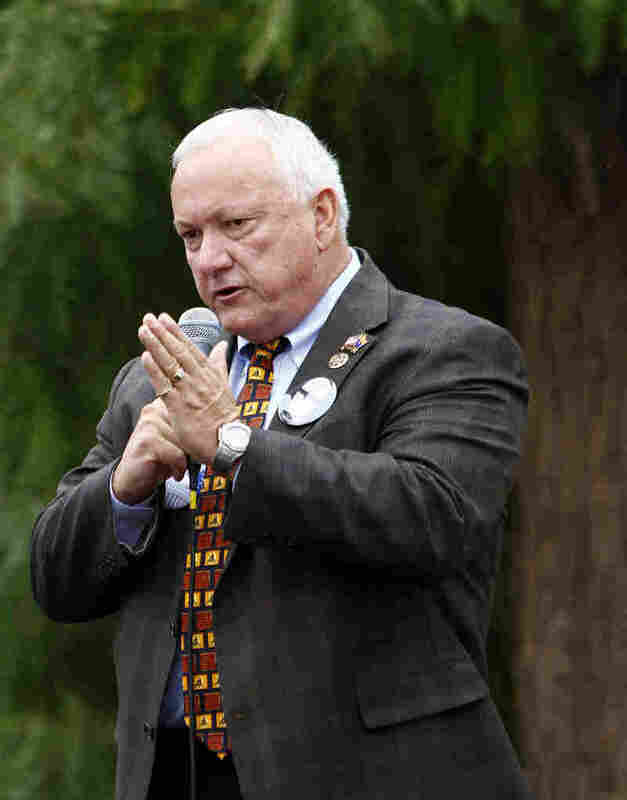 Arizona state Sen. Russell Pearce says the bill was his idea. He says it's not about prisons. It's about what's best for the country. "Enough is enough," Pearce said in his office, sitting under a banner reading "Let Freedom Reign." "People need to focus on the cost of not enforcing our laws and securing our border. It is the Trojan horse destroying our country and a republic cannot survive as a lawless nation." But instead of taking his idea to the Arizona statehouse floor, Pearce first took it to a hotel conference room. It was last December at the Grand Hyatt in Washington, D.C. Inside, there was a meeting of a secretive group called the American Legislative Exchange Council. Insiders call it ALEC. It's a membership organization of state legislators and powerful corporations and associations, such as the tobacco company Reynolds American Inc., ExxonMobil and the National Rifle Association. Another member is the billion-dollar Corrections Corporation of America — the largest private prison company in the country. It was there that Pearce's idea took shape. "I did a presentation," Pearce said. "I went through the facts. I went through the impacts and they said, 'Yeah.'" The 50 or so people in the room included officials of the Corrections Corporation of America, according to two sources who were there. Pearce and the Corrections Corporation of America have been coming to these meetings for years. Both have seats on one of several of ALEC's boards. And this bill was an important one for the company. According to Corrections Corporation of America reports reviewed by NPR, executives believe immigrant detention is their next big market. Last year, they wrote that they expect to bring in "a significant portion of our revenues" from Immigration and Customs Enforcement, the agency that detains illegal immigrants. In the conference room, the group decided they would turn the immigration idea into a model bill. They discussed and debated language. Then, they voted on it. "There were no 'no' votes," Pearce said. "I never had one person speak up in objection to this model legislation." Four months later, that model legislation became, almost word for word, Arizona's immigration law. They even named it. They called it the "Support Our Law Enforcement and Safe Neighborhoods Act." "ALEC is the conservative, free-market orientated, limited-government group," said Michael Hough, who was staff director of the meeting. Hough works for ALEC, but he's also running for state delegate in Maryland, and if elected says he plans to support a similar bill to Arizona's law. Asked if the private companies usually get to write model bills for the legislators, Hough said, "Yeah, that's the way it's set up. It's a public-private partnership. We believe both sides, businesses and lawmakers should be at the same table, together." Nothing about this is illegal. Pearce's immigration plan became a prospective bill and Pearce took it home to Arizona. "I don't go there to meet with them," he said. "I go there to meet with other legislators." 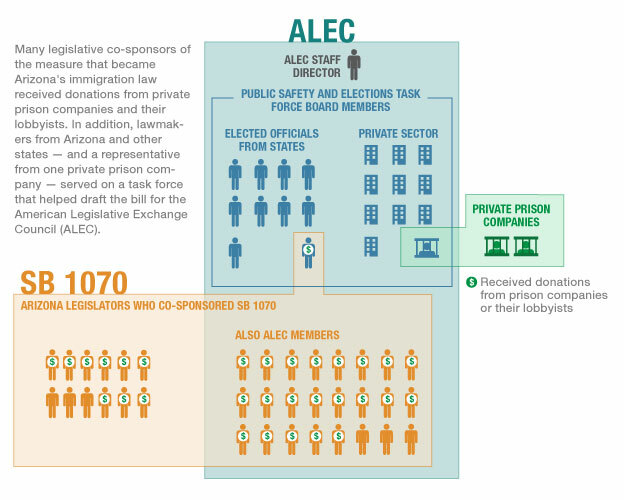 As soon as Pearce's bill hit the Arizona statehouse floor in January, there were signs of ALEC's influence. Thirty-six co-sponsors jumped on, a number almost unheard of in the capitol. According to records obtained by NPR, two-thirds of them either went to that December meeting or are ALEC members. The prison company declined requests for an interview. In a statement, a spokesman said the Corrections Corporation of America, "unequivocally has not at any time lobbied — nor have we had any outside consultants lobby – on immigration law." In May, The Geo Group had a conference call with investors. When asked about the bill, company executives made light of it, asking, "Did they have some legislation on immigration?" After company officials laughed, the company's president, Wayne Calabrese, cut in. "This is Wayne," he said. "I can only believe the opportunities at the federal level are going to continue apace as a result of what's happening. Those people coming across the border and getting caught are going to have to be detained and that for me, at least I think, there's going to be enhanced opportunities for what we do." Produced by NPR's Anne Hawke. As we reported, Arizona state Sen. Russell Pearce was the originator of the draft legislation that later became Arizona SB 1070. This story did not mean to suggest that the Corrections Corporation of America was the catalyst behind the law or that it took a corporate position in favor of the legislation. 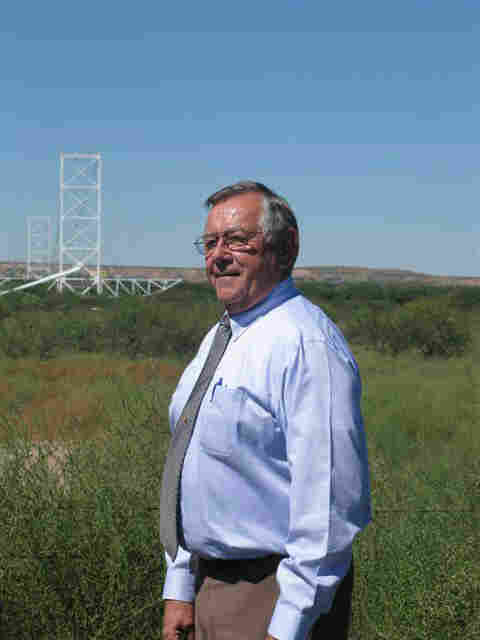 In our 2010 broadcast piece we said: "Last December Arizona Sen. Russell Pearce sat in a hotel conference room with representatives from the Corrections Corporation of America and several dozen others. Together they drafted model legislation that was introduced into the Arizona Legislature two months later, almost word for word." Although CCA did have a representative at the ALEC meeting where model legislation similar to 1070 was drafted, we didn't mean to suggest that CCA wrote the language. Nov. 18, 2011 — In the introduction to the radio version of this story, we said that the legislation that became the Arizona immigration law (SB 1070) was drafted at a meeting of the American Legislative Council, or ALEC. The introduction should have made a clearer distinction between drafting the Arizona bill and ALEC's role in turning it into "model" legislation to be submitted in states across the country.